So about two and a half years ago, my chest broke out continuously. Not knowing how to react properly, I did the inevitable and mercilessly popped all of them. This of course caused trauma to the skin by my chest and now, I have about 13 of these raised, shiny, poreless, hairless, and light scars. These scars are extremely embarrassing, and I am very nervous as to what to do as pool time has already arrived. Being a guy known to be very athletic and known to have a six-pack, it is almost unavoidable, and I am not sure how I did it last summer. This summer I hope I don't have to go through that again. HOW DO I GET RID OF THESE? I went to the dermatologist and he said they were permanent, but I feel like he didn't even take a look a them and disregarded it. If it helps, I'm asian and 15 years old. you could go to a skin therapist and get them lowerd by silicon, after that tattooed in you own skin colour bij A scar specialist. How much would the silicon be and would it be permanent? Also wouldn't the tattoo not change colors when I get tan and pale. hey what do they feel like.? sicne from a picture were you told thet are hypertrophic scars? They mainly feel like regular skin, maybe just a little tighter and they don't hurt at all. Ok, thank you, I will look into that. What do you guys think about microdermabrasion? my chest is a problem too sometimes. I dont know much about lasers etc but that they scars fade with time for me but its still noticeable close up. Nope it's completely dead, but these scars are definitely permanent. They are raised above the skin and the dermatologist made it clear that they were permanent. If you just have red marks and they are neither raised nor indented, consider yourself lucky as your skin will return to complete normal. You could also try TCA CROSS on those spots. Thank you daew, I will look into all of those treatments. I am very lucky indeed, these scars could have turned out much worse. 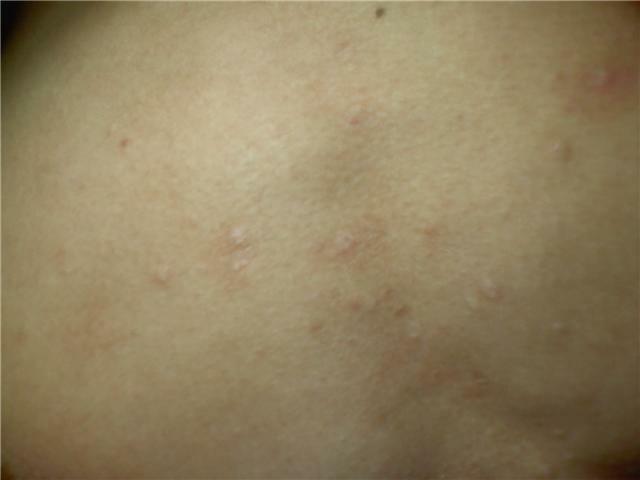 Those dont look raised enough to be keloid scars but i believe they are hypertrophic scars and they are permanent.. but the good news is you can go to the dermatologist and get a cortizone injections on them and they will flatten but with the color i would do a pulsed dye laser like the candela v beam. Ask your derm about it . Yes I am definitely sure they are not keloids, and pretty sure they are hypertrophic. Derm appts take too long so I'm currently using mederma and praying to God that it works, and that it works quickly.